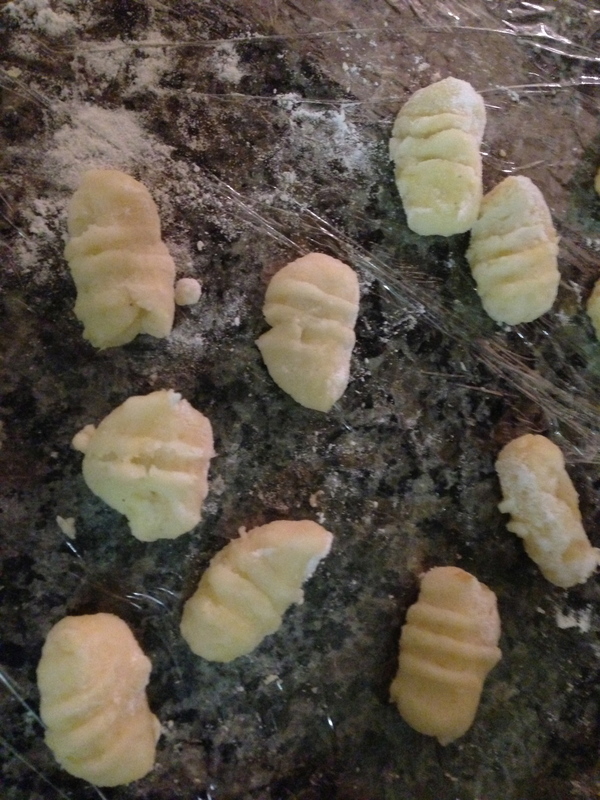 Browse: Home / Making Gnocchi for the First (3) Times! I’ve been pretty obsessed with gnocchi lately, though I have no clue why. I tried it once when Garrett brought some home from Caffe Mac’s (Apple’s dining hall), and have been kind of thinking about it ever since. I made gnocchi 3 times in the past 2 weeks, each time according to Food Nouveau’s gnocchi recipe with some adjustments in cooking method based on online research. 1. Bake/Boil the potatoes in their skins. If boiling, leave the skins whole (no puncturing), to keep the water out of the potato. Soggy potatoes = doughy gnocchi! 2. Peel the potatoes, then smash (with a fork or potato masher)/grate/potato rice them. I ended up using a pastry cutter because I felt it broke up the potato bits while still allowing the potato to be fluffy. Using a grate was a bit unwieldy, and I don’t have a food mill/potato ricer. I mix in the olive oil at this step. When the olive oil hits the steaming potatoes, it smells AWESOME. 3. Mix in the flour, egg, and salt. I was always a bit nervous about putting the beaten egg yolks into the hot potato, so I usually made a well out of the potato, into which I dumped about a cup of flour. Then I put the egg yolks into the flour, so there was a bit of buffer between it and the potato. Then, working fast, I just mixed it all together! 4. Form the gnocchi. Separate the dough into four pieces, then roll each piece into a log. Slice the log, then take those pieces and roll them off the edge of a fork to get the ridges. 1. Bake the potatoes instead of boiling them. This ensures no water gets into the potato, which results in a gummy dough. 2. Make the gnocchi dough while the potatoes are still hot. Peeling the hot potato may be a bit tricky, but it’s worth the effort. The flour mixes in much more easily when the potato is piping hot, so you won’t have to use as much flour to get the dough together. Too much flour + over-kneading = tough gnocchi. My parents are quite health-conscious, so I didn’t want to use a cream-based/butter-based sauce for them. I came up with this alternative using what was in the fridge. 1. Sautee shallots and garlic until fragrant, then add diced tomatoes with some salt and let it cook down to a paste. 2. Add milk and let it all turn pink and bubbly. If you want it to be a bit cheesier, add another type of cheese (mozzarella, cream cheese) at this point and mix it in. 3. Dump the cooked gnocchi in the sauce and let the flavors marry. 4. Finish with grated parmesan! ← Luciables’ Turkey Dumpling Soup!